Gizmodo UK reported a few months back about an online magazine about photography that is unlike any other and I’ve been meaning to post about it on here as it is very much a pointer to how digital magazines should embrace the possibilities of the technology. 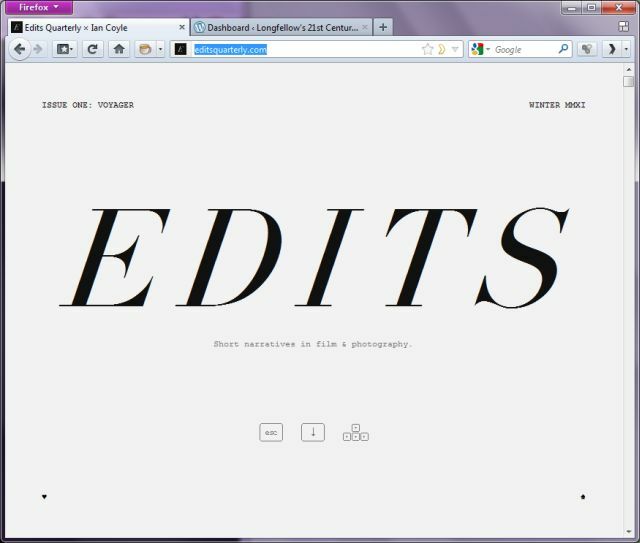 Edits Quarterly, by Ian Coyle, doesn’t try to recreate the look and feel of a paper magazine, you simply scroll down it, or rather the images and pages smoothly, seamlessly slide upwards revealing the next article. The use of typography is wonderful, the imagery striking and the articles are superbly written. It is a truly innovative and beautiful publication.